Chloe's mummy gave me a pressie today. 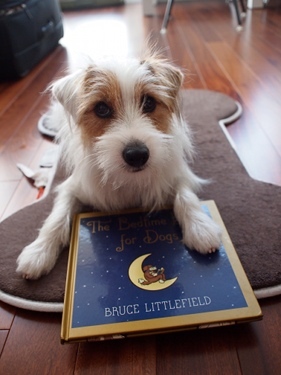 It's a Bedtime Book for Dogs by Bruce Littlefield! It's a book for mummy to read to me before bedtime! What a great bonding experience! This awesome little book is about a dog who decided to explore his usual activities without his favorite companion as he didn't want to wait, only to realise that it wasn't at all fun without a good friend along. 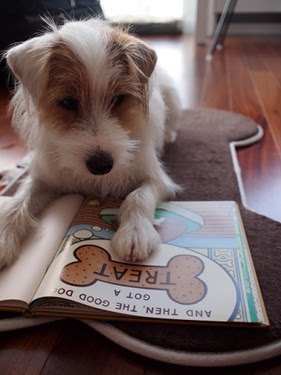 The book has words that dogs (ME ME ME!) 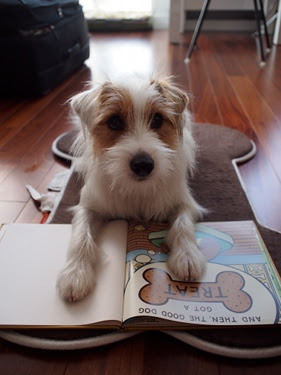 understand and a story line that kids (both 2 and 4 legged) would love. Hee, since I'm so smart, I decided to read the book myself. Spying on mummy who's disturbing spying on me. After a good 10 minutes, I finally finished reading! And guess what, I flipped the book down and pointed at something I wanted. I stared hard at it, hoping mummy gets my hint. Another cute touch of the book is illustrated portrait of various cute doggies on the first and last pages..
and guess what, I'm now officially one of them too! 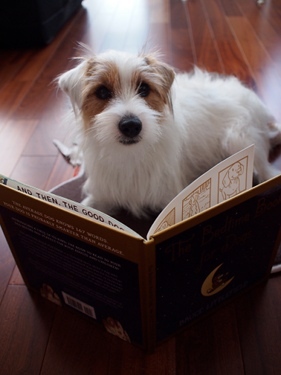 I'm gonna bug mummy to read me the book instead, tonight.